With these words, like Helen of Troy launching a thousand ships across the Aegean, Brad Herzog’s wife launched a single Winnebago Aspect onto the open road. A modern-day Odysseus in Kerouac clothing, Brad Herzog plunges into a solo cross-country adventure in search of insight. With middle age bearing down on him and another college reunion fast approaching, he takes stock: How has he measured up to his own youthful aspirations? In contemporary America, what is a life well lived? What is a heroic life? From the foothills of Washington’s Mount Olympus, through the forgotten corners of America, and finally to his alma mater in Ithaca (New York), Brad shares this personal odyssey of a lifetime. Stopping in classically named towns, he delves into the lives of everyday heroes, including a teacher in a one-room rural schoolhouse in Troy (Oregon), a bomb-diffusing soldier in Sparta (Wisconsin), and a woman in the Endless Mountains of Pennsylvania who survived childhood trauma but maintains a hold on more than a dozen distinct personalities. These encounters and Brad’s effortlessly infused musings on Homer, Joseph Campbell, and Lewis and Clark create the perfect balance of past lessons and present epiphanies. Like Odysseus, Brad returns to the arms of his loved ones with many hard-earned answers. 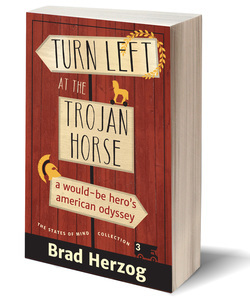 TURN LEFT AT THE TROJAN HORSE: A Would-be Hero’s American Odyssey is a historical, philosophical and conversational trek across America and through the universal truths of mythography. However, in the end it is simply the story of one man trying to find his way.